Dermatology Devices Market size was valued at USD 8.4 billion in 2017 and is expected to witness over 9.5% CAGR from 2018 to 2024. Increasing incidence of skin associated diseases and disorders coupled with growing demand for cosmetic procedures are factors driving the global market. Growing number of new cases related to skin cancer and required diagnosis as well as treatment of skin cancer is anticipated to upsurge dermatology devices revenue. According to National Cancer Institute 2013-2015 data, around 2.3% of women and men will be diagnosed with melanoma of skin and in 2015, there were nearly 1.2 million individuals living with melanoma of skin in U.S. Rising expenditure on skin care treatment and technological advancement in skin care devices is anticipated to propel industry growth. Growing health awareness regarding skin problems along with favourable demographic trends and increased access to dermatologic services are aspects boosting demand for dermatology devices market. As demand is growing so the competition is also on surging level, through alternative treatment options. Diagnostic devices segment dominated and accounted for 57.0% in 2017, due to rising awareness of skin diseases and increasing number of diagnosis for skin problems. Treatment devices segment is projected to grow lucratively at a CAGR of 10.5% over the forecast timeline. The growth is attributable to escalating incidences of skin cancer coupled with rising expenditure on skin treatment. Light therapy devices (LED therapy) segment of treatment devices held largest market share of more than 29% in 2017 and is projected to grow at a 10.8% CAGR over the forecast timeline. The market share is attributable to associated benefits of the light therapy devices coupled with increasing adoption in treatment of seasonal affective disorder (SAD), psoriasis, acne, wrinkles, scars. Associated benefits include repairing of sun related skin damage, enhances muscle recovery, speeds wound healing, and fades wrinkles, scars as well as stretch marks. LEDs provide more light that is usable due to its tight wavelength span. Additionally, LEDs also generate less heat, are more durable, efficient and are considered eco-friendly as compared to fluorescent sources. Such advantages are projected to boost industry growth. Lasers segment is projected to grow at a CAGR of 11.5% over the forecast period owing to wide ranging application such as removal of warts, mole, vascular lesions and pigmented lesions treatment, hair removal. In addition to, rising use of lasers in cutaneous disorder and associated benefits are factors rendering positive impact on business growth. Moreover, increasing implementation of lasers for dermatologic conditions is anticipated to boost industry growth in coming years. Skin cancer accounted for more than 26% industry share in 2017 and is projected to continue its dominance over the coming years. Increasing incidence of skin cancer coupled with advancing technology for treatment of skin cancer is anticipated to propel dermatology devices market growth. According to Australian Government Cancer statistics 2017, around 10.4% individuals were diagnosed with melanoma skin cancer. Skin rejuvenation segment is anticipated to grow at a CAGR of 10.7% on an account of rising demand for cosmetic procedures coupled with advantages offered by skin rejuvenation treatment. Advantages such as reduction in pore sizes, improves appearance of acne scars, age spots, it also smooths fine lines, wrinkles and improves skin texture and tone. Additionally, skin rejuvenation treatment also stimulates collagen, it is cost-effective and is done by minimally invasive method. Such factors encourage customer buying behaviour thereby, fuels dermatology devices market growth. U.S. market held over 92% industry share in 2017 with its market growth attributed to factors such as, escalating incidence of skin cancer and skin associated diseases and surging demand for cosmetic procedures. Furthermore, availability of advanced treatment options, increasing awareness regarding skin diseases and willingness to spend more for skin problems are aspects projected to boost market growth. Germany market is estimated to grow at 9.9% CAGR over forecast time due to surging demand for cosmetic procedures and increasing incidence of skin related diseases. Rising demand for advanced diagnostic dermatology equipment will boost the business growth. Indian market is anticipated to grow at a significant rate over the coming years due to rising incidence of skin associated diseases such as acne, eczema, etc and increasing expenditure on skin treatment. 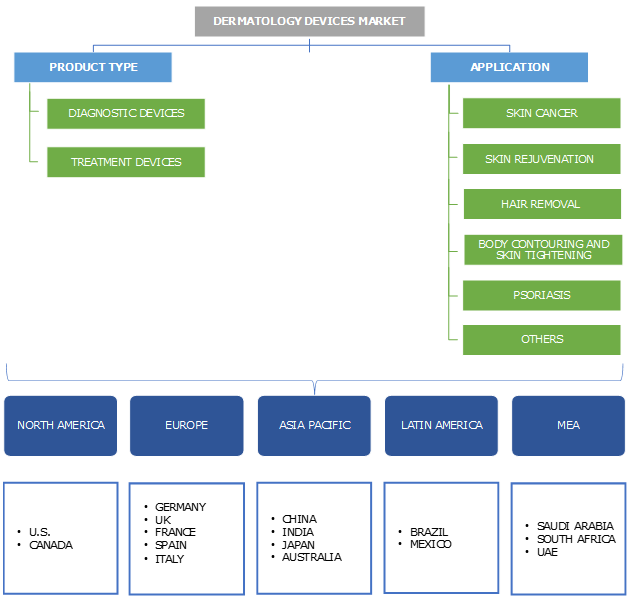 Prominent players operating in dermatology devices market are 3Gen, Alma Lasers Ltd., Ambicare Health Ltd., AMD Global Telemedicine Inc., Beijing Toplaser Technology Company Limited, Biolitec Ag, Cortex Technology ApS, Cutera, Inc., Dansys Group, Ellipse A/S, Genesis Biosystems, Inc., Heine Optotechnik GmbH & Co. Kg, Hologic, Inc., Image Derm Inc., Leader Healthcare, Lumenis, Inc, Michelson Diagnostics, Solta Medical Inc. (Bausch Health Companies, Inc.). Organic, inorganic strategies and new product launch are key industry growth strategies adopted by prominent players to increase their revenue and geographic expansion in industry. For instance, in January 2018, Hologic’s division Cynosure launched TempSure Envi that is a radiofrequency FDA cleared device and it minimizes wrinkles, fine lines, as well as tightens skin by soft tissue coagulation. Emerging countries provide high growth potential as rising number of individuals are spending more on skin treatment. Increasing unhealthy eating habits, improper skin care routine, pollution is some of the aspects fuelling skin disorders and diseases. Advances in technology of lasers and launch of enhanced equipment that offer cost effective treatment solutions are factors boosting industry growth. Technology oriented companies are introducing less invasive devices for consumers with various needs. New technologies in light source devices and laser devices are rapidly being developed for treatment of dermatologic conditions thus, propelling market growth.